KANSAS CITY, Mo. 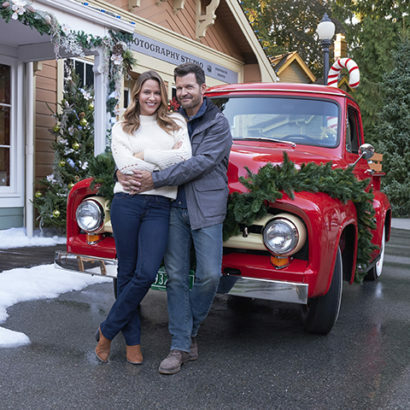 (October 29, 2018) — The idyllic town of Evergreen overflows with Christmas magic and romance in “Christmas in Evergreen: Letters to Santa,” a new, original movie premiering Sunday, November 18, (8 p.m. ET/PT) on Hallmark Channel, as part of the network’s #1-rated programming event, COUNTDOWN TO CHRISTMAS. With this popular annual event, Hallmark Channel is historically the #1 television network in all of Q4. Jill Wagner (“Pearl in Paradise,” “Teen Wolf”), Mark Deklin (“Designated Survivor”), Holly Robinson Peete (“Meet the Peetes,” “Hanging with Mr. Cooper”), Barbara Niven (“Chesapeake Shores”), Andrew Francis (“Chesapeake Shores”), Rukiya Bernard (“One Winter Weekend”) and Ashley Williams (“The Jim Gaffigan Show”) star in the heartwarming story of romance and family set against the backdrop of the idyllic town of Evergreen. “Christmas in Evergreen: Letters to Santa” is the second movie installment of holiday stories based on the collection of fine art by Hallmark Cards’ master artist and illustrator, Geoff Greenleaf. To further enhance the viewers’ experience and immerse themselves in the magical holiday town, the complete Christmas in Evergreen collection is available at Hallmark.com. On her way to visit her hometown of Evergreen, Lisa (Wagner) meets Kevin (Deklin), when his car is stalled on the side of the road. Though his car quickly – and perhaps miraculously – restarts, the pair soon after crosses paths again in Evergreen. Reconnected by Evergreen restaurant owner Carol (Niven), Lisa and Kevin work together to restore a general store they used to visit as children. Sparks fly between them and they quickly find themselves contemplating permanent moves to Evergreen. Evergreen’s Christmas magic, which brought town veterinarian Allie (Williams) love the year before, not only inspires love for Lisa and Kevin, but also connects the kindhearted Michelle (Peete) with a single dad visiting his son for the holidays. While romance blossoms for the two couples, the town comes together to try to grant a Christmas wish written in a letter to Santa years ago. Christmas in Evergreen products are exclusively sold in Hallmark Gold Crown stores nationwide and on Hallmark.com. Visit Hallmark.com/stores to find the nearest location.